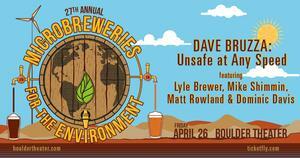 "Microbreweries for the Environment” is an annual benefit concert that was started in 1993 by student volunteers at the University of Colorado Environmental Center. The Boulder Theatre is the premier producer, with support of veteran volunteers. The event is possible because of the MBE committee donating time and our-- incredibly appreciated-- brewers donating kegs of beer. 27 - 16 = ?